Pan-India ONE solution for Urban Poverty is failing. We have seen it in JNNURM and shall see it again in Rajiv Awas Yojana. Small and Medium cities are facing the brunt. These cities are one not equipped with know-hows and appropriate capacity and nor do they have enough focus of centrally sponsored schemes to solve the urban poverty issues in these cities. Jawaharlal Nehru Urban Renewal Mission (JNNURM), launched in 2005 was directed towards development of our cities and for the first time managed to have some bit of spotlight on even the urban poor. Within JNNURM there were/are on ground actual proposals and reforms at governance level that were to help ‘include’ the urban poor in the development context. JNNURM Funding has been provided making with conditions of governance level reform. Some of these reforms are mandatory while other are optional level reforms that have to be taken up by the Urban Local Bodies (ULBs). ( In this context , it is important to recall how urban planning has now become a mandate of urban local bodies with the 74th Amendment and ULBs are now to take charge of undertaking ‘development’ for the poor). And other related mandatory reform of municipal accounting which makes it mandatory for the ULBs to shift to the double entry accounting system which should reflect the separate municipal fund for services to the poor and recording of the targeted revenue expenditure of delivery of services to the urban poor per annum. These reforms and projects have been prescribed in great spirits, attempting for the first time to dissolve all issues regarding the uncertainty that had been created due to institutional arrangement for slum improvement programs between different agencies – slum boards, housing boards, development authority, municipal body etc. that had led to problems in implementation and also the failure to provide for the poor in the urban planning process. But, have these proposals really been working for Small and Medium Cities? Small and Medium Cities are where there is at present a sudden boom of ‘Urbanisation’. These are the cities that are being hit by urban poverty at a rate that is not even conceivable. And at the same time it is here, in these Small and Medium Cities that a ‘preventive addressal of urban poverty’ can be taken up rather than finding ‘futile cures’ in the million plus cities. 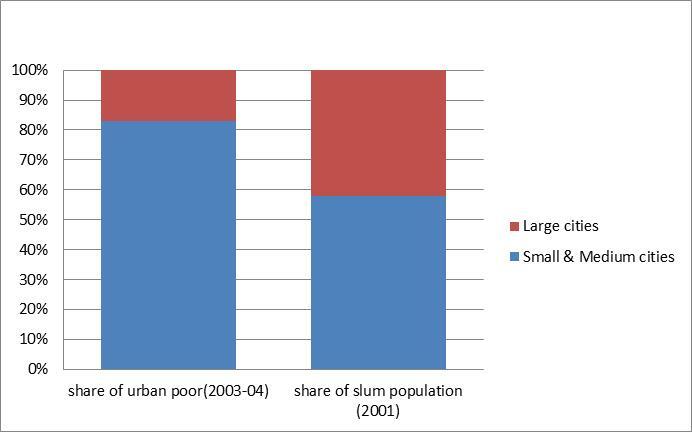 From the graph below it is visible how the share of urban poverty and slum population has been increasing in small and medium cities. It is interesting to note that about 50% of urban population are living in slums; the city is seeing unprecedented growth rate after it became the capital of the new state of Chhattisgarh. But, has JNNURM really considered these aspects? 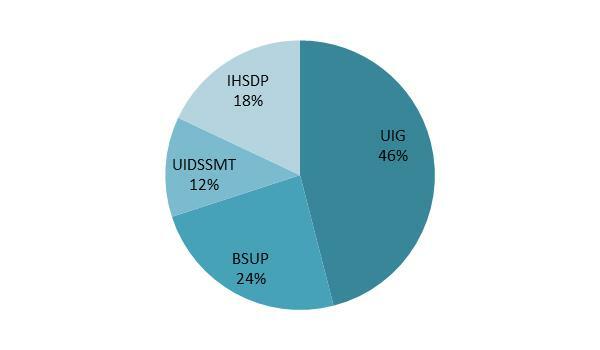 75% of the assistance has been committed to 65 mission cities under UIG and BSUP under JNNURM; 25% is for the rest 640 small and medium towns under IHSDP and UIDSSMT. On an average, bigger cities have had a higher per capita investment. 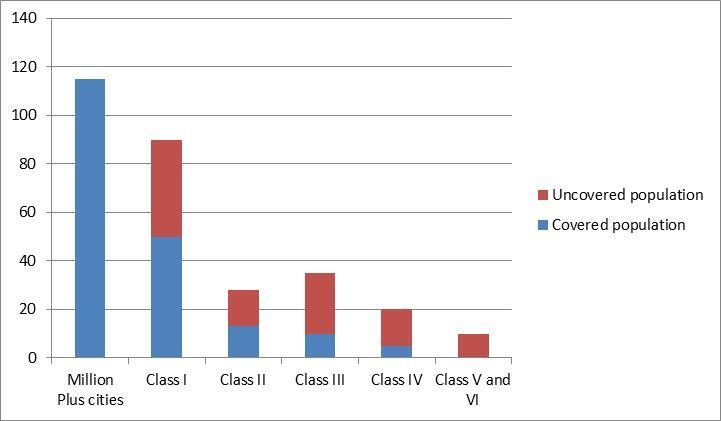 Also, the percentage of urban population covered under these two schemes decreases with the size and class of towns. How has JNNURM then through its mechanism attempted to ‘serve’ small and medium towns differently? For certain, slums are a problem in larger cities but in smaller towns the question of poverty alleviation is more pressing but has seen much lesser focus, funding and appropriate approach. These small and medium towns are struggling to provide for housing for the urban poor and are also unable to undertake the governance level reforms. Most of these towns have not even shifted to a double accounting system; there is no separate entry for services being catered to urban poor. Nagar Panchayat such as Sanawad in Madhya Pradesh, and many others in their books state that 25% of the total revenue is utilised on services for the urban poor, but at present there is no mechanism to check this expenditure. Other municipalities directly have put the central sponsored allocations under this and show complete expenditure as required. Small and medium towns at present do not even have their books digitized and require far greater hand holding than larger cities. Also, wrongly so, most ULBs believe that optional reforms are actually optional! Therefore optional reforms such as earmarking 25% of land in all new housing projects for Economically Weaker Sections and Low Income Groups do not see the light of the day. The fact is under JNNURM, optional reforms are not optional- just that they are not the most priority reform that should be taken up by ULB; however, the phasing of these reforms would be at the choice of the ULB/ state. Two reforms need to be carried out every year over the mission period. Other municipalities and corporations find it difficult to implement this reservation reform. Infact most of the corporations such as Indore complain of how they saw loss in housing investment over last few years when the shelter fund was stopped and it was mandatory for private housing projects to designate the land/ houses for urban poor in their schemes. They clearly stated how ‘Shelter Fund’ mechanism wherein the Private builder had the obligation to contribute a portion of the land developed by them or CASH proportionate to the land value towards Ashraya Nidhi (Shelter Fund) for pro-poor housing. Most builders obviously offered to give CASH! Of course this model doesn’t allow an equitable city with no apartheid class divided zones to be created within the city and has also created a shortage of land for the corporation to even undertake pro-poor housing! Mission is said to suffer from the lack of an integrated approach; related issues like land, health, education and employment are being handled by separate Ministries at the central level and no strategy towards convergence of the same has been formulated. Complete failure in respect to ‘community participation’. Overnight slums have been removed and housed in ‘flats’ that have already been created, even the slums that were not even in the ‘listing’ under the BSUP housing in cities like Raipur. 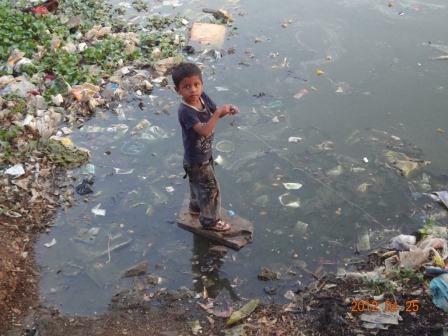 In the same city, no example of in-situ slum rehabilitation has been successful. The only model the corporation attempted was the case of Telibhanda, where in the community was deceived and shifted to far off transit homes and even after 3 years still do not have their in-situ houses back in the land that belonged to them! Also, JNNURM even lacks an articulated clear resettlement policy. There is great ambiguity in the air, which and why slums are being removed overnight, are market forces acting up?! Cities have also chosen not to invest in BSUP extensively; thrust of JNNURM has been on infrastructural and buses instead! Options of micro-financing and role of PPP for housing urban poor has not been explored. ULBs of small and medium towns also faced a peculiar situation wherein the State Local Nodal Agency (SLNA) did not provide the necessary ‘capacity’ to the ULB in time. Small Nagar Panchayats and Municipalities are not equipped with qualified staff or know-how of how to include the cause of urban poor within their new mandate after 74th Amendment. JNNURM in its vision is essential, it has attempted to focus on issues that are crucial for Indian Cities, but it has failed in its approach. One size fits all solution does not work in a country like India wherein the level of urbanisation differs exponentially across the nation. There is a need for far greater bottom up planning, far greater capacity building and far greater hand holding in small and medium towns, than what is at present being offered. The future of a sustainable urbanization is in these towns and the only way to address it is to ‘take care of the excluded – and work towards an inclusive society”. Ignorance is not a bliss for these cities – we need to empower them! From .linkedin: Pravin Bhardwaj • Focus always get shifted to the bigger cities, the smaller one are not able to submitt the DPR also. Most of the CDP made for smaller cities and towns are not developed properly. From .linkedin:Tango Elangovan • Min. of Urban Devpmt, GoI have several schemes to help improve basic infrastructures in small & medium sized cities.Planners who are aware of this take advantage of this fund. These are not reaching the target groups is a matter of concern. Because professional expertise unavailable in smaller towns, DPR and CDP kind of requirements are not met. Jnnurm cities are big enough to engage consultants and grab the projects. A monitoring mechanism has to be evolved outside the Local self Govt bodies, preferably, social auditing, using a mix of local and outside experts. Tango Elangovan • Kerala has shown the way in this regard. Decentralised planning empowered LSG’s to come out with implementable plans to suit their purse. Locally available experts (mostly Retd Officials) came handy in supporting the ULBs. Social auditing gained wide acceptance when corruption-free measures were introduced at inter-state check posts. Public acceptance is the most important aspect of all.